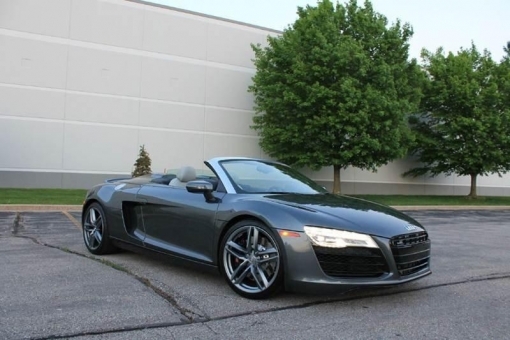 2015 Audi R8 Spyder V8 Quattro convertible., Daytona Grey Perl on Titanium Nappa Leather, Navigation, Bang & Olufson premium sound, Backup camera with parking sensors, active suspension, heated seats, active rear spoiler, LED headlights & tail lights and much more. Factory warranty until 7/2019 or 50k AND, Audicare maintenance for 35k and 45k service INCLUDED!!!! Fully serviced, records, brand new Bridgestone Potenza RE11's, immaculate condition clean history and best price anywhere. Full set of keys, windscreen, nav disc, all as new!